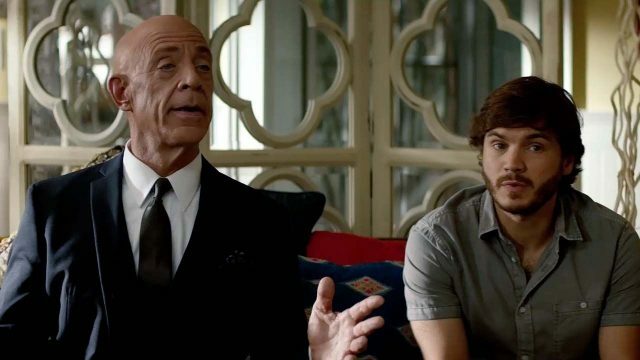 Not even J.K. Simmons' considerable comedic talents can rescue All Nighter - a tranquillized, misjudged and directionless snoozefest. First impressions are disastrous, with Mr. Gallo blankly dismissing the wimpy, awkward creature his daughter has attached herself to. Ginnie seems to come to her senses, too, as she breaks up with Martin soon after. This all makes it something of a surprise when, six months later, Mr. Gallo unexpectedly turns up at Martin’s front door. Ginnie isn’t returning her father’s calls and so, fearing the worst, her father has returned to LA to search for her, enlisting Martin as his guide to hipster Los Angeles. And so the unlikely pair traipse from organic café to yoga studio to nightclub, following a trail of breadcrumbs that they hope will lead to the truth about her mysterious disappearance. It’s a hackneyed setup and largely an excuse to put this odd couple in various (theoretically) comedic situations. Simmons is an intrinsically funny man, effortlessly able to conjure up comedy with a silent, deadpan stare. Hirsch is no slouch either, apparently taking inspiration from Jeff Bridges’ The Dude in the way he absentmindedly ambles through situations and avoids conflict. Simply having the pair on screen is a decent comedic baseline, with Simmons responsible for the lion’s share of the laughs. But a couple of things gradually take their toll. First is a complete absence of narrative propulsion. Despite some early promising tendrils of suspense, Seth W. Owen’s script feels like it’s hooked on tranquillizers, any excitement punctured by the lazy way his characters amble around and that they constantly stop for drinks to hang out. The height of action comes in a police chase, a desperate pursuit which causes the pair to break into a slightly hurried stroll. About midway through you pick up that Ginnie is essentially a MacGuffin – an excuse to compare and contrast Mr. Gallo’s traditional forthright masculinity with Martin’s slacker hippiedom. But the thrust of all this – that Martin is regaining his testosterone mojo by hanging around with Mr. Gallo – leaves a bad taste in the mouth. It just feels regressive to argue that what a man needs to be happy is red meat and a willingness to punch people in the face. As you can probably guess, the film ends with each having learned a little something from the other, though precisely what it is eludes characters, director, writer and audience alike. More important than all that stuff is the simple fact that All Nighter just isn’t very funny. For example, the movie vastly over-estimates the comedic value of Simmons wearing a pink women’s T-shirt that reads “Keep It Juicy.” The nadir comes in the form of Gary (Taran Killam), a put-upon schmo who absentmindedly tags along with the two leads for the finale. For some reason he consumes magic mushrooms and proceeds to painstakingly grind through every goddamn psychedelic cliché in the comedy playbook. Most of this film is just a bit boring, but Gary manages to be actively annoying: a comedic black hole that threatens to swallow up everything around him. By the time the credits roll (after a mercifully brief 80 minutes), you can’t help but feel that Wiesen has squandered a hell of a lot of potential. There’s a whole bunch of great comedians in this cast, all of whose talents are wasted in service of soporific plotting, first-draft dialogue and tired old gags that have all been done better before. Simmons is as watchable as ever, but even his Herculean efforts can’t save this snoozefest.